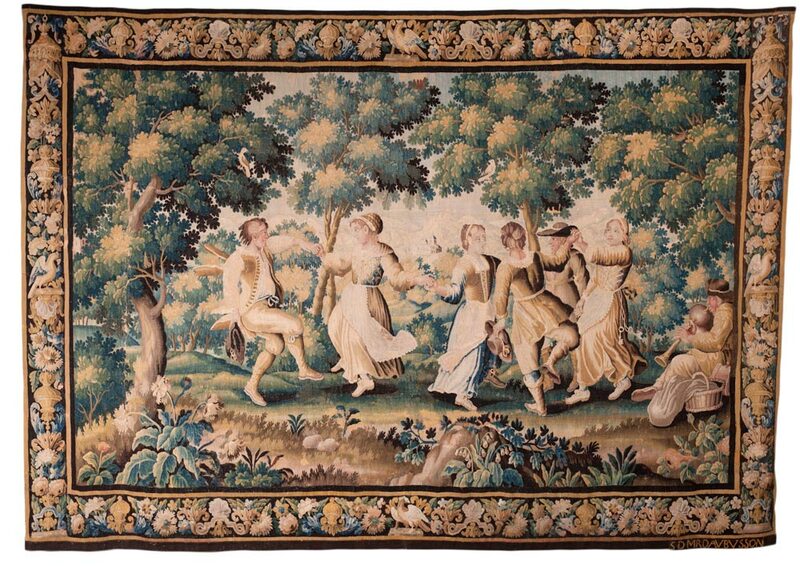 After the difficult period of the Nantes Edict revocation in the late 17th Century, the 18th Century and its new decorative momentum is a period of trading prosperity for the manufacturers. Following the Nantes Edict revocation, the manufacture is in a very bad situation: bad weaving and dying quality, weak artistic level of the cartoons. During the 1720’s, the royal administration implemented with the profession a deep reform of the royal Manufacture, which ends up to new status in 1731. It allowed engaging a real technical, artistic and commercial rise of the manufacture, which would radiate over the entire Europe. The Kings painter is finally affected to Aubusson to bring there once a year his new cartoons inspired by the artistic actuality in Paris: Jean-Joseph Dumons (1687-1779). 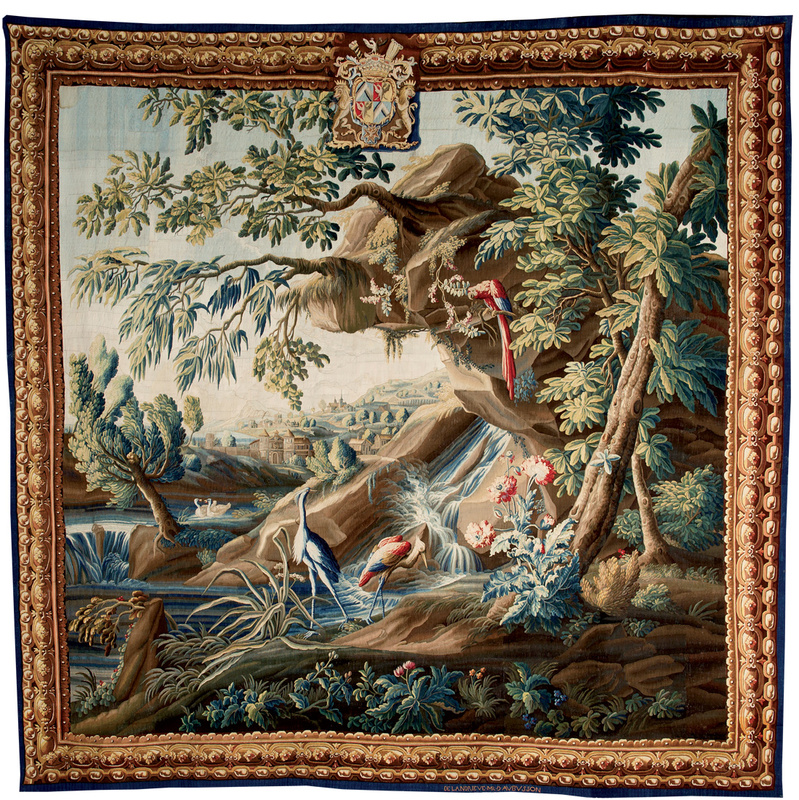 The tapestry production leaned on the adaptation of great models created by Bouchet, Watteau, Oudry or Huet. Rapidly, the renewed prosperity brings the manufacturers to get their own models to Aubussonnais artists like Finet, Barraband or Roby, who will soon realize themselves in grisaille cartoons – tone-on-tone painting, in cameo, using different shades of grey, from white to black, to give an illusion of embossed design. The artistic offer diversifies itself. The taste transforms completely comparing to the 17th Century; the new compositions are simpler, first of all created in a decorative purpose. The Enlightenment century would prefer to great heroic scenes more profane subjects: bucolic and happy landscapes, picturesque, greeneries and oriental scenes (the “Chinoiseries”, that is imitations of the Chinese style), colored scenes of child’s play or country life… The mythology is readapted to a gallant style, it is more researched to please or to affect.